I remember Fred Rumsey well. When I first started watching county cricket in 1969, thanks to the old forty overs per side John Player’s Sunday League, he used to turn out for Derbyshire. 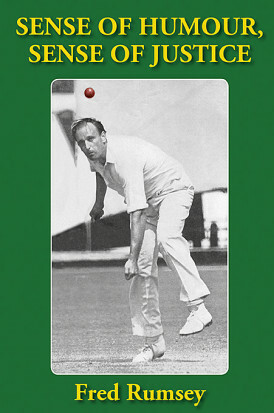 There was no really fast bowling on Sundays because, for some years, run ups were limited to fifteen yards, but by the time I saw him left armer Rumsey was nearer forty than thirty and, effective though he undoubtedly was, he was most definitely ‘military medium’. Given what I saw with my own eyes I was surprised to be told by father that a few years earlier, when playing for Somerset, Rumsey was a genuine fast bowler and had been capped for England half a dozen times. From what he went on to add my father clearly believed that Rumsey had been treated somewhat shabbily by the selectors, although I am not sure that view was an entirely objective one, as he went on tell me that he had on one occasion met the man I was watching amble up to the wicket. An affable individual my father got on with most people, but he wasn’t normally easily impressed. As a half decent cricketer himself he’d met a few First Class players over the years for various reasons, and generally talked more about the character flaws he had seen in them than the positives he took from his encounters. Rumsey was different however. The reason they came into contact was that Rumsey was a fellow guest at a function my father had attended the details of which, if I ever knew them, now escape me, but to the end of his days when the name Rumsey cropped up in conversation a broad smile would spread across the face of Chandler Senior. Rumsey was neither the first or last man whose humour my father enjoyed, but I don’t ever recall him using the words thoroughly decent man to describe anyone else, and as a result the name Rumsey and my father’s ringing endorsement of him are things that have stayed with me over the best part of half a century. Having now read Rumsey’s story I can see he had one or two things in common with my father, not least an ability to complete the Daily Telegraph crossword more or less instantly. Having done many things in his life Rumsey has, at 83, now written an autobiography. He has clearly had much help from publisher Stephen Chalke but, whilst not being explicit on the point Chalke’s foreword strongly suggests that the writing was very much Rumsey’s own. That of itself is no great surprise given that Rumsey is clearly an intelligent and resourceful man, but there is a tinge of regret that he has not previously turned his hand to writing other than, forty years ago now, marshalling The Thoughts of Trueman Now. Born in London in December 1935 Rumsey’s account of an eventful wartime upbringing is a common enough story, but not one that is often heard these days. The fact that that childhood seems to have been a generally happy one is a subject even less commonly committed to print. From school Rumsey moved on to work in a merchant bank, national service in the RAF and throughout that time carried with him a passion for cricket and other sports. After his national service Rumsey became a salesman with a glove company, and it is clear that by the time his employers had relocated to Worcester he was an important member of staff and had a bright future in business. That much is evidenced by the fact that when Rumsey was first offered a professional contract by Worcestershire it was for a season’s pay of just one sixth of his then salary. That against that background he chose to accept the county’s offer must be proof positive of just how strong Rumsey’s passion for cricket was. There are entertaining stories of off season jobs and a somewhat unconventional lifestyle whilst on Worcestershire’s books, but ultimately Rumsey was not a success at New Road and after his two year contract ended he was not re-engaged. Still not done with the game Rumsey then moved into league cricket where, remarkably, in his mid twenties he finally learnt the art of inswing. At last able to move the ball as well as deliver it at speed two injury call ups for his old county as an amateur brought Rumsey the impressive haul of 18 cheap wickets in 1962. Clearly a different proposition now Rumsey was signed by Somerset and embarked on the most successful part of his playing career. There were 102 wickets for Rumsey in his first Somerset summer and a fund of amusing stories the best of which involved the aftermath of his, on his captain’s instructions, bouncing his namesake, Trueman. In only his second full season England came calling and Rumsey played against Australia. With 2-99 he did better than his teammates as Bob Simpson’s men piled up a first innings of 656-8 and had surely earned a further chance in the final Test. It is difficult for Rumsey’s reader to conclude otherwise than that a rather testy exchange with the Chairman of Selectors, Walter Robins, after the first day scuppered his chances of being retained. By this time it is clear that speaking his mind was not something that Rumsey had a problem with, and it is difficult to imagine that was not at least part of the reason why, a year after his debut, his fifth Test was his last. The stories continue however, and there are insights aplenty and all the while it becomes clearer and clearer where Rumsey’s destiny lay. Throughout his story he dwells occasionally on the injustices he encountered in life and to which cricket contributed more than its fair share. Rumsey’s account of how the player’s union, the Professional Cricketers’ Association, was formed is fascinating. I was in good company in previously misunderstanding Rumsey’s role in the setting up of the PCA having believed, as did Stephen Chalke, that Rumsey was just one of a number individuals involved. In the end he was, but initially he was on his own, and ruffled as many feathers as he gained supporters. Again there are some fine tales, those regarding the involvement in the project of John Arlott and the salary negotiations before the start of the Sunday League being the highlights. Rumsey must have been a man with great energy as 1968 saw him with three roles. Opening bowler and trade union general secretary sounds like responsibility enough, but not for Rumsey who also persuaded Somerset to appoint him to a ambassadorial role as well, as a fund raiser. He was a great success in all three. After attracting sufficient funds to more than cover his fee at Somerset Rumsey moved on to Derbyshire to do a similar public relations job and to play the one day game. His playing days over Rumsey then moved into property developing and later began Fred Rumsey Travel, helping cricket fans follow England round the world. Those ventures, together with a long association with the Lord’s Taverners, provide a further treasure chest of tales for Rumsey to draw on as he moves towards the end of his story and a chapter of reflection on what has most definitely been a life well lived. The fact that Rumsey has had such a varied and busy life helps, as does the fact that he is clearly, as my perceptive father noted, a thoroughly decent man. Couple those factors with an understanding of how to entertain, an ability to write and the best publisher in the business and there is only one outcome. Five stars for Sense of Humour, Sense of Justice, the best cricket book I have read in a long time. This week Archie reviews a biography of the first man of West Indian descent to play Test cricket.